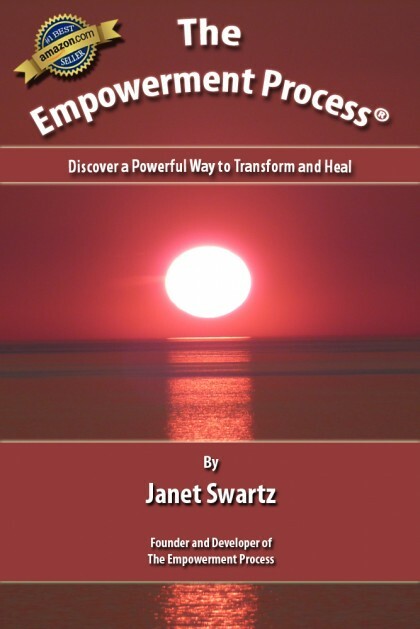 Janet’s book tells her story of how the Empowerment Process came into being. Each chapter is a nugget of wisdom and inspiration, sharing the infinite possibilities that self-transformation and healing offers. She addresses questions including how do you know if you’re ready to transform, what are the keys for transformation, and relates personal experiences with her clients to exemplify the powerful shifts with an Empowerment Process. The chapters address such topics as improving relationships, bringing in financial success, managing weight issues, dealing with overwhelm, fear and anxiety, and connecting to a spiritual path. Janet is the developer and teacher of the Empowerment Process®, a powerful, effective way to positively transform disempowering thoughts and feelings in the mind/body system and create a new energizing perspective. She offers EP sessions and Intuitive Guidance consultations as well as Mentoring Programs in-person and by phone and the internet. Janet is a valued teacher of Empowerment Process courses which are available locally, nationally and online. I was ready for a major, positive life shift, but needed some guidance. That’s when the Universe led me to Janet. Her process (as described in this book), which is done over the phone, involved backtracking to a major traumatic event in my youth. Once we identified this event, Janet showed me that I could change the dis-empowering memories of the event, and take my life in a whole new direction. The result was, and remains, a deep and profound shift in my connection with a Higher Power… and that connection is EVERYTHING. I can’t recommend her services highly enough. The book is a quick read and will prepare you for your life-changing session with the author.